At first glance this was just an off-the cuff remark, but on further consideration it may have been a comment on the activities of landscape photographers. The world is beset by a multitude of problems, with climate change being one of the most pressing. And what do landscape photographers do? We drive across the country and take pictures of rocks. Not that often in the jungle perhaps, but at the coast……..we do a lot of it. And that brings me to the title of the post. 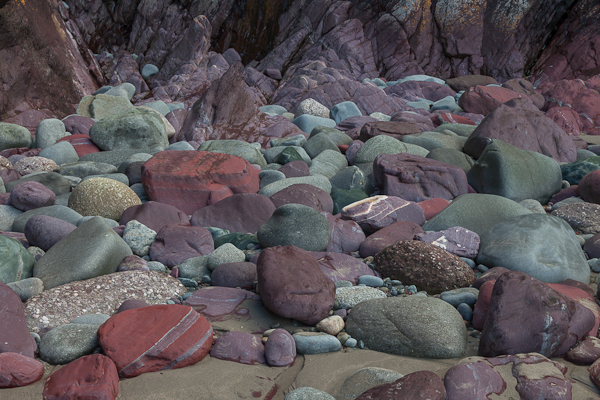 One quite popular and easily accessible beach in Pembrokeshire backs on to a quite astonishing little cove with purple and bright red sandstone bedrock and a variety of boulders in red, purple and green/grey. The beach itself features on one of my postcards and the boulders are easily visible in the image. It is surprising that more photographers don’t venture down there, but even those from Pembrokeshire seem to give it a miss, let alone the big names from England. I’m not going to name the location; that would make it too easy. But look at this image – you’d expect it to be elbow room only down there at low tide! As for “purpleworld” the sense of colour at the back of the cove is so complete that one’s eyes begin to compensate for it and it starts to look “normal”. Turning one’s back and looking out to sea again the real world seems unreal. This entry was posted in Uncategorized and tagged landscape photographers, landscape photography;, Pembrokeshire. Bookmark the permalink.